Die photo of self-healing PA system showing RF blocks, sensors, actuators and self-healing digital core, and close up photos of output stage transistor before and after laser cutting. Credit: Steven M.Bowers et al. Imagine that the chips in your smart phone or computer could repair and defend themselves on the fly, recovering in microseconds from problems ranging from less-than-ideal battery power to total transistor failure. It might sound like the stuff of science fiction, but a team of engineers at the California Institute of Technology (Caltech), for the first time ever, has developed just such self-healing integrated chips. The team, made up of members of the High-Speed Integrated Circuits laboratory in Caltech's Division of Engineering and Applied Science, has demonstrated this self-healing capability in tiny power amplifiers. The amplifiers are so small, in fact, that 76 of the chips-including everything they need to self-heal-could fit on a single penny. In perhaps the most dramatic of their experiments, the team destroyed various parts of their chips by zapping them multiple times with a high-power laser, and then observed as the chips automatically developed a work-around in less than a second. "It was incredible the first time the system kicked in and healed itself. It felt like we were witnessing the next step in the evolution of integrated circuits," says Ali Hajimiri, the Thomas G. Myers Professor of Electrical Engineering at Caltech. 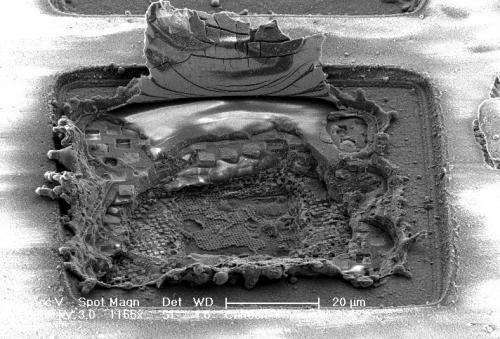 "We had literally just blasted half the amplifier and vaporized many of its components, such as transistors, and it was able to recover to nearly its ideal performance." The team's results appear in the March issue of IEEE Transactions on Microwave Theory and Techniques. Until now, even a single fault has often rendered an integrated-circuit chip completely useless. The Caltech engineers wanted to give integrated-circuit chips a healing ability akin to that of our own immune system-something capable of detecting and quickly responding to any number of possible assaults in order to keep the larger system working optimally. The power amplifier they devised employs a multitude of robust, on-chip sensors that monitor temperature, current, voltage, and power. The information from those sensors feeds into a custom-made application-specific integrated-circuit (ASIC) unit on the same chip, a central processor that acts as the "brain" of the system. The brain analyzes the amplifier's overall performance and determines if it needs to adjust any of the system's actuators-the changeable parts of the chip. Interestingly, the chip's brain does not operate based on algorithms that know how to respond to every possible scenario. Instead, it draws conclusions based on the aggregate response of the sensors. "You tell the chip the results you want and let it figure out how to produce those results," says Steven Bowers, a graduate student in Hajimiri's lab and lead author of the new paper. "The challenge is that there are more than 100,000 transistors on each chip. We don't know all of the different things that might go wrong, and we don't need to. We have designed the system in a general enough way that it finds the optimum state for all of the actuators in any situation without external intervention." Looking at 20 different chips, the team found that the amplifiers with the self-healing capability consumed about half as much power as those without, and their overall performance was much more predictable and reproducible. "We have shown that self-healing addresses four very different classes of problems," says Kaushik Dasgupta, another graduate student also working on the project. The classes of problems include static variation that is a product of variation across components; long-term aging problems that arise gradually as repeated use changes the internal properties of the system; and short-term variations that are induced by environmental conditions such as changes in load, temperature, and differences in the supply voltage; and, finally, accidental or deliberate catastrophic destruction of parts of the circuits. 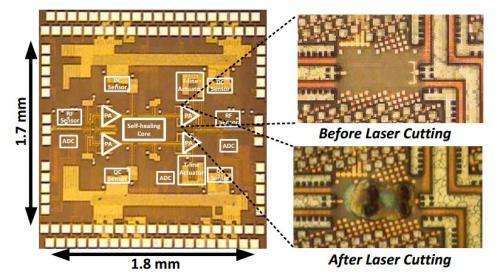 The Caltech team chose to demonstrate this self-healing capability first in a power amplifier for millimeter-wave frequencies. Such high-frequency integrated chips are at the cutting edge of research and are useful for next-generation communications, imaging, sensing, and radar applications. By showing that the self-healing capability works well in such an advanced system, the researchers hope to show that the self-healing approach can be extended to virtually any other electronic system. "Bringing this type of electronic immune system to integrated-circuit chips opens up a world of possibilities," says Hajimiri. "It is truly a shift in the way we view circuits and their ability to operate independently. They can now both diagnose and fix their own problems without any human intervention, moving one step closer to indestructible circuits." Along with Hajimiri, Bowers, and Dasgupta, former Caltech postdoctoral scholar Kaushik Sengupta (PhD '12), who is now an assistant professor at Princeton University, is also a coauthor on the paper, "Integrated Self-Healing for mm-Wave Power Amplifiers." A preliminary report of this work won the best paper award at the 2012 IEEE Radio Frequency Integrated Circuits Symposium. The work was funded by the Defense Advanced Research Projects Agency and the Air Force Research Laboratory. Really impressive but what happens when the 'ASIC' breaks? There's undoubtedly some limit beyond which damage can't be fixed. After all, your body self repairs but has a limit, too. And error-correcting techniques like check sums don't confer invulnerability, either. They just make the chance of failure much smaller. Failing at some finite number of faults, even if it's small, is a whole lot better than "one." Build in redundancies, like voting logic. Would this be applicable for EMP warfare/solar flares? If I understand correctly, the induced surges primarily damage the input stages of chip due to the antenna like traces/wires. Nice for satellites exposed to micro and nano meteor strikes. Like to have this if MY alabaster azz was to ride one of those exploration ships. Would not get on one if it was powered by kerosene though, like all the chem rockets we have use a form of kerosene. Old barn lamp fuel is pretty good rocket fuel for legacy rockets. We need new rockets, like mirror fusion or focus fusion rockets for take off power...........these will be good for single stage take off and landing. Fusion is our gateway technology to space. These circuits would be good in control circuits in any fusion system too, anywhere. Yes it can help and in fact this technology is an offshoot of military technology that has been around for some time now. Its primary function was as a smart airframe resistant to battle damage. In the lab it was tested with extreme success and if even a hair line width is left between damaged sections it still can pass multiple signal paths to other sections self correcting to the shortest route. Terminator!!! Jk, this is excellent news for robots that are sent on missions to other planets. If the algorithms can be expanded to be whole system wide then the future for damaged satelites and shot up robots to continue on to their objectives is looking brighter. More reality chasing SiFi: We've all see Arnie repairing himself.